Say 'bonjour' to our new international pal, Monsieur TséTsé! Think of him as your favorite French Canadian pen pal whose come for an extended stay. Particularly fond of raspberry jam, napping in the sun and reading bedtime stories, Monsieur TséTsé is the best kind of company bound to become your bon ami. A word to the adults: A monster for the smallest amongst us, Monsieur TséTsé is an organic cotton beastie with sweet embroidered facial features and knotted ears - perfect for the teething tot. 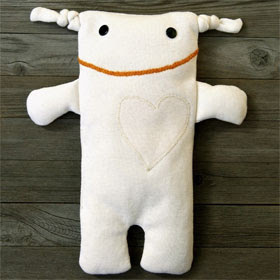 Designed by Erica Perrot, he is lovingly handmade in Montreal by Petites Mains, a social integration organization with 10% of the profits from the sale of this product donated to UNICEF. 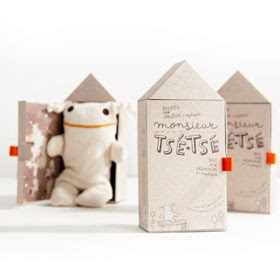 Monsieur Tsé Tsé complies with CE safety requirements making him suitable for babies under 36 months and arrives in an adorable cardboard house decorated by Isabelle Arsenault, a Quebec illustrator. Machine wash and hang to dry.